Bruce Nilson was born and raised in Alcester, South Dakota where his grandfather and father owned and operated the Nilson Funeral Home. After serving in the Korean War, Mr. Nilson graduated from the University of Minnesota’s Mortuary Science Program. 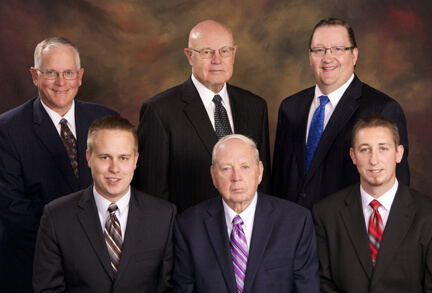 In 1961, Bruce purchased the Nilson Funeral Home, formerly the Gerhards Funeral Home, in Fergus Falls, with chapels in Battle Lake, Ashby and Evansville. In 1995, Mr. Nilson partnered with Glende-Johnson-Nelson Funeral Home. He now enjoys being an active part of funeral service, while still having the opportunity to hunt and fish and spend time with his three children and seven grandchildren. Bruce is a member of First Lutheran Church in Fergus Falls, a member of the VFW in Fergus Falls and of the Ashby American Legion. Doug also comes from a funeral service background, where both his grandfather and father were active in the business in Brooten, Minnesota. After graduating from the University of Minnesota in Minneapolis, Doug served his apprenticeship at the Hoplin Funeral Home in Glenwood. Following his service in the United States Army, Doug moved to Fergus Falls where he worked as a licensed director at the Glende-Johnson Funeral Home. Doug eventually purchased the Funeral Home and although he is "semi-retired", Doug continues to serve families. Doug and his wife Virginia live in Fergus Falls and have two married daughters. Doug and his wife are active members of Bethel Lutheran Church in Fergus Falls. He is also a member of the Otter Risers Kiwanis, the VFW and the Ashby American Legion. Rick was born and raised in Battle Lake, Minnesota. He graduated from the Fergus Falls Community College and then the University of Minnesota in Minneapolis. After graduating from the U of M he was employed with funeral homes in Virginia, Minnesota, as well as the Bertha area. In 1995, Rick joined the staff at Glende-Nilson Funeral Home and Cremation Service. Rick attends the Battle Lake Alliance Church and is a member of the Battle Lake Lions Club. Rick and his wife Ann live on their farm by Battle Lake. They have three sons and seven grandsons, and they enjoy riding horse-back riding and camping. Chris comes from a funeral service background as well. He grew up and attended school in Page, North Dakota, where his father owned and operated the Lindsey-Carlson Funeral Home. After graduating from the University of Minnesota, he worked at funeral homes in Starbuck and Morris, Minnesota. In 2004, Chris moved to Fergus Falls, and joined the staff at Glende-Nilson Funeral Home & Cremation Service. Chris and his wife Brenda live in Fergus Falls and have two daughters and one son. He is a member of the Fergus Falls noon Kiwanis. A native of Thief River Falls, MN, Andrew joined the staff of Glende-Nilson in June of 2011. Even though he comes from a farming background, Andrew has always had an interest in funeral service. Luke Johnson joined the staff of Glende-Nilson Funeral Homes in August 2014, though has lived in the Fergus Falls community for numerous years, having been employed at the former Boschert-Norman and Faith and Hope Funeral Home. He grew up and attended school in Lake Park, graduating from Lake Park/Audubon High School in 2000. Luke then went on to attend Minnesota State University Moorhead from 2000 -2004. After his generals he then continued his education at the Cincinnati College of Mortuary Science in Ohio. While there he served as a lab assistant where he worked closely with the University Of Cincinnati and their body donation program. He received his Bachelor’s Degree in Mortuary Science in 2007. Luke and his wife Lisa live on Wall Lake and have one son, Rusty. In his spare time, he enjoys hunting and fishing. Luke is a licensed Funeral Director in Minnesota and North Dakota and also holds his insurance license. Having had Glende-Nilson Funeral Homes serve her family for decades, Karen Holte joined the staff as office manager in March of 2010. She brings with her years of experience in the business sector as well as an associate business degree from Minnesota State Community and Technical College. Originally from Evansville, Karen and her husband David have lived on a grain and livestock farm near Wendell since 1993. They have two grown sons, Kyle and Kerby. During her personal time, Karen enjoys driving motorcycle, quilting, family gatherings and volunteering. Karen is an active member of the Rock Prairie Church, rural Wendell, and Quilts of Valor. She also finds time to volunteer at Lakeland Hospice.